Digital radiographic imaging systems, such as those using photostimulable storage phosphor (PSP), amorphous selenium, amorphous silicon, charge-coupled device (CCD), and metal oxide semicon- ductor-field effect transistor (MOSFET) technology, can produce adequate image quality over a much broader range of exposure levels than that of screen/film imaging systems. In screen/film imaging, the final image brightness and contrast are indicative of over- and underexposure. In digital imaging, brightness and contrast are often determined entirely by digital post-processing of the acquired image data. Over- and underexposures are not readily recognizable. As a result, patient dose has a tendency to increase gradually over time after a department converts from screen/film-based imaging to digital radiographic imaging. 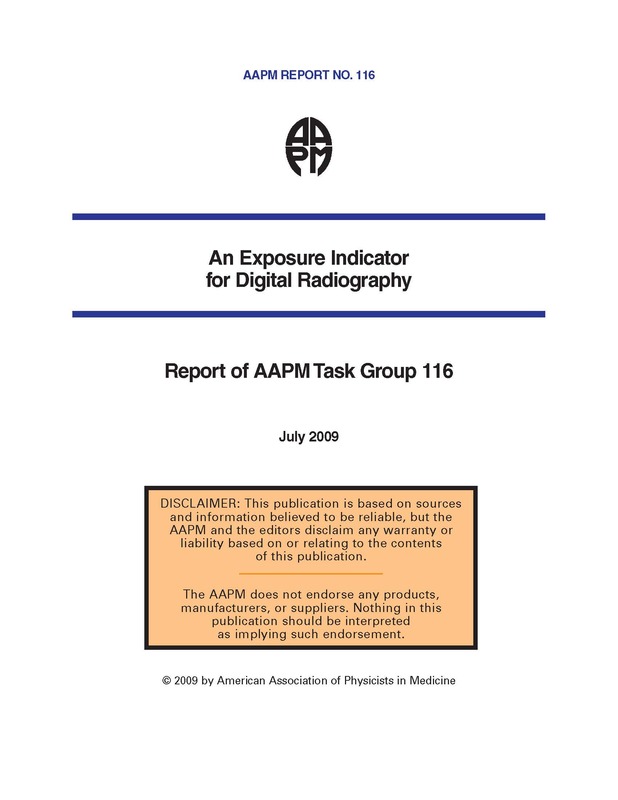 The purpose of this report is to recommend a standard indi- cator which reflects the radiation exposure that is incident on a detector after every exposure event and that reflects the noise levels present in the image data. The intent is to facilitate the production of consistent, high-quality digital radiographic images at acceptable patient doses. This should be based not on image optical density or brightness, but on feedback regarding the detector exposure provided and actively monitored by the imaging system. A standard beam calibration condition is recom- mended that is based on RQA5, but uses filtration materials that are commonly available and simple to use. Recommendations on clinical implementation of the indices to control image quality and patient dose are derived from historical tolerance limits and presented as guidelines.